At the 1908 Olympics in London, the lead runner in the marathon staggers into the stadium and collapses within yards of the finish, only to be picked up and kindly helped over the line by solicitous Olympic officials. That same year, England takes the gold in the tug-of-war; archery is the only event for women; and world records are fairly easy to come by. Competitive sports are not far removed from simple recreation -- more for the player than the spectator. Sport, in short, is only a game. Sporting Fever follows boxing, baseball, soccer, and more, as sports transitions from a mere pastime to a fiercely competitive -- and commercial -- enterprise to a potent expression of national pride and politics. Travel to 1921 New Jersey for the Jack Dempsey-Georges Carpentier "fight of the century;" to South America of the 1930s for the "war" between soccer titans Uruguay and Argentina; to Berlin and the 1936 Olympics as Germany gears up for a war of a different sort. Throughout the program, sports fans the world over remember the drama, the thrill, the exhilaration that their favorite sports teams and athletes roused. Sporting Fever begins when the troops come home from the Great War. In the United States, Americans were hungry for excitement -- and entrepreneur Tex Rickard was eager to oblige. Sport was about to become Big Business. In 1921, Rickard relentlessly advertised and promoted the fight between his barroom brawler Jack Dempsey and French war hero Georges Carpentier. Ninety thousand spectators paid up to fifty dollars per ticket to attend the fight. It was the largest crowd ever assembled for a sporting event -- the first million dollar gate in history. But it was much more. Rickard reinvented sports with the fan in mind. And at the center of his irresistible drama was Dempsey, a hero who rose from nothing to the top of the world -- the quintessential American Dream. 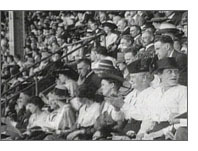 Baseball, meanwhile, had been a popular American diversion since the Civil War. That, too, would change in the 1920s. Owners began grooming the game to attract a larger audience. Anna Daube Freund remembers: "They were trying to get women interested in baseball -- which they did. And I think the atmosphere at the ball game was very, very exciting. You had great times rooting. You could say almost anything you wanted. You never heard anything said that was very vulgar. You might call an umpire a bum." Freund and her sisters grew up near Yankee Stadium and couldn't resist the pull: "We would go to ball games rather than the movies. . . . My worst punishment was to say `You can't go to the ball game.'" She also remembers Babe Ruth, the greatest homerun hitter of them all: "You didn't have [the home run] until [Ruth] started -- and it was amazing. It was wonderful to watch, because [he] was always so graceful." Thanks to Ruth, attendance soared. Never before had an athlete achieved such status. He was an orphan who shook hands with presidents -- and earned more than they did, giving life to the dreams of the common man. For the price of a ticket, a fan could share the experience of an individual succeeding on his own terms. But the phenomenon was hardly unique to the United States. Uruguay, 1930: Spectators and teams from all over the world arrive for an exciting, new international event -- the first World Cup. Thirteen national teams took the challenge. Uruguay and Argentina made it to the final round, but relations between the two countries grew so strained that they were at breaking point before the match. Ondino Viera was a Uruguayan coach at the time and remembers: "The championship developed into a psychological war between Uruguay and Argentina. . . . It was climate of virtual war: a football war." Uruguayan footballer Diego Lucero remembers the finals: "It was a terrible thing. A struggle. Hard. The match was a battle." A battle that Uruguay won, four to two. The ability of sports to galvanize national pride and identity was not lost on the world's nationalist leaders. Adolf Hitler used the Olympic Games of 1936 as an advertisement for Aryan achievement. Twenty-year-old Fritz Schilgen was tapped to run the torch into the stadium. He would be the symbol of the Olympian ideal -- and not coincidentally, the Aryan ideal. Fritz Schilgen: "Everything was done to make the whole affair most effective. Naturally, at that time in 1936, my selection was not made on the basis of my running style alone. Without any doubt, 1936 was an opportunity to show off. That means also to show what stands behind it." The athletes of the world's eleventh Olympiad, whether they knew it or not, were soldiers in a new kind of war. And black athletes on the US team -- who dominated events in track and field -- were a severe threat to the Nazi propaganda offensive. 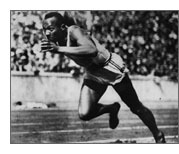 Hitler would outrage US public opinion when he refused to congratulate three-time gold-medal winner Jesse Owens. Helen Stephens on the other hand -- the US women's 100 meters champion -- found herself on the receiving end of a Nazi charm offensive. She was escorted to meet Hitler on receiving her medal: "Hitler came in, accompanied by an interpreter, and gave us a sloppy salute. I didn't return it. I gave him a good old Missouri handshake. And I put pressure on it and that gave him the wrong message, because he immediately began to hug me and pinch me and squeeze me and see if I was real. And he said `Why not spend the week in Berchtesgaden,' his mountain retreat." Helen Stephens declined. Robert Mitchell of the British polo team remembers the seductive pull of Nazi fanaticism at the closing ceremony: "The lights came down and the Olympic flame went out and there was utter silence and utter darkness, and it really was most impressive, and then they started sieg heil, and that was when a hundred thousand people were going `sieg heil, sieg heil,' and I literally put my hands in my pockets to stop myself being hypnotized into doing it with them. It was absolutely hypnotic." 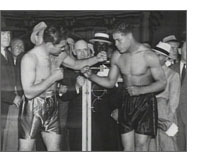 In 1938, all the forces that had shaped twentieth century sport -- showmanship, money, nationalism -- came together in a single event: the Joe Louis-Max Schmeling contest for the heavyweight championship of the world. At stake was the heavyweight crown -- and for Louis, a chance at redemption. Two years earlier, the two found themselves on the brink of an international propaganda war. The black Louis was an American hero. Schmeling was held up as the Nazi's archetypal Aryan. Louis, a ten-to-one favorite, went down in the twelfth round. Eddie Futch, a trainer, remembers: "That was one of the saddest days in this country that I've ever seen. It was like a great president had died. The people just couldn't believe it." It was a triumph for Nazi Germany. Now, facing their second fight, the stakes were even higher: in some ways, it would be the first battle of World War II. According to Eddie Futch, "it was a new and great feeling. [Louis] was the representative of all America -- all America." And when Louis won, it was a victory steeped in symbolism. Louis, Schmeling, and other popular sports heroes were used by their countries in wartime propaganda campaigns. By the time of the Second World War, sport was already deeply rooted in the lives of millions, as a source of drama and excitement -- and a powerful declaration of national pride. Sporting Fever is written, produced, and edited by Mark J. Davis; the narrator is Alfre Woodard. People's Century is a co-production of WGBH and the BBC -- filmed around the world and shaped in Boston and London. Executive producer for WGBH is Zvi Dor-Ner; senior producer is David Espar. Peter Pagnamenta is executive producer for the BBC. National corporate sponsorship for the series is provided by Conseco, Inc. Major funding is provided by public television viewers and the Corporation for Public Broadcasting. Additional funding is provided by the Richard Saltonstall Charitable Foundation and The Lowell Institute.